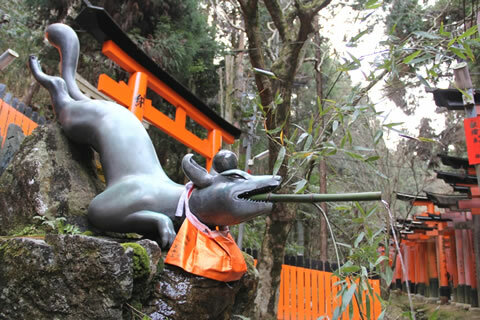 Beloved for centuries as O-Inari-san, Inari shrines are visited by people to pray for good harvests, business success, household safety, and other wishes. There are believed to be some 30,000 Inari shrines around Japan, and the head shrine of them all is the Fushimi Inari Shrine (Fukakusa Yabunouchi-cho, Fushimi-ku, Kyoto). This ancient shrine was founded in the year 711 to house the Shinto deity Inari Okami, making it a site of worship for more than thirteen centuries. The name Inari comes from Inari being the god of rice, and is believed to originate with the phrase rice (ine) grows (naru), although there are many other theories. ▲Mt. Inari (left rear) and the Mail Hall of the Fushimi Inari Shrine. Mt. Inari, at the southern end of the Thirty-Six Peaks of Higashiyama, can be seen rising up behind the Main Hall (honden). Mt. Inari itself is the kannabi, or abode of the gods, that is what is actually worshipped, with the entire mountain being considered sacred. There is a pair of foxes, the messenger animal of the god Inari, guarding both sides of the entrance in front of the two-storied gate (romon). The fox on the left holds a key in its mouth, while the fox on the right holds a sacred jewel, and they both protect the shrine. ▲Foxes are the messenger animal of the god Inari. 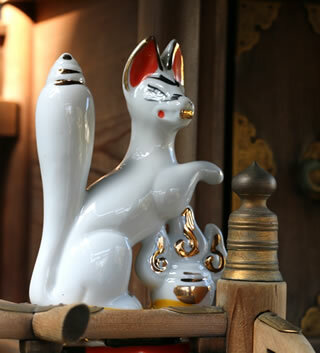 These foxes, which guards the front of the Main Hall and the Inner Worship Hall hold a rice ear in their mouth to symbolize the fact that Inari is the god of rice and crops. After cleansing your hands and mouth at the chozuya washing basin, head through the two-storied gate and around the Outer Worship Hall to the Main Hall and the Inner Worship Hall. Ring the bell to wake the gods and offer a prayer. The Thousand Torii (senbon-torii) start behind the Main Hall. There are actually about ten thousand torii total on Mt. 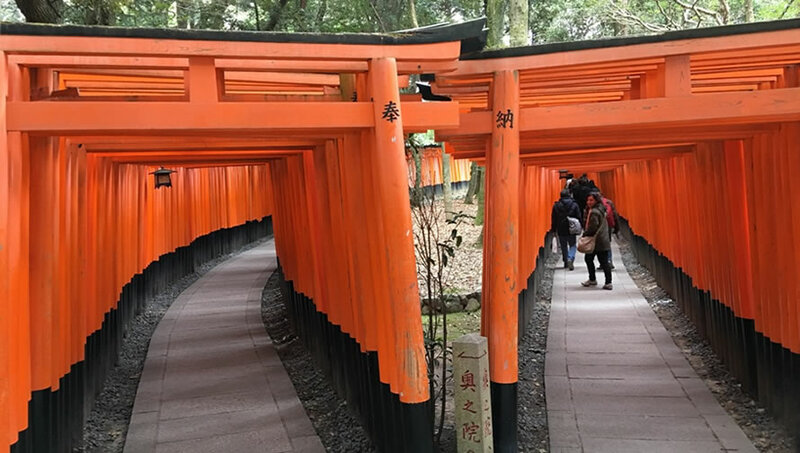 Inari, lining the pilgrimage paths, and visitors and worshippers from all over Japan and the world venture inside, deeper and deeper as if they are being drawn by the vermilion color. ▲The vermilion color of torii gates symbolizes life force, and is widely used in sacred areas in Japan as a color that repels evil. 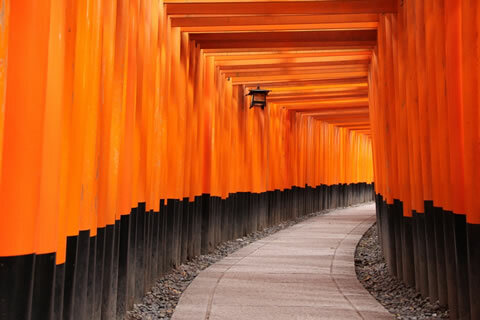 It is particularly known as the color that symbolizes the power of Inari shrine. The ubiquitous vermilion torii gates can be seen all over Japan, not just at shrines, but in shops and businesses as well. 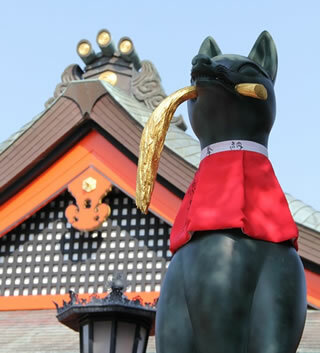 Many companies have their own shrine to Inari, where they pray for safety and business prosperity. In the book How a Company Can Prosper for 300 Years (Yoshihiko Takubo, ed. Graduate School of Management, Globis University, Toyo Keizai Inc., 2014), the authors note how many long-established companies emphasize religious rites and worship. The god Inari is also worshipped by sake brewers, who will establish small Inari shrines within their companies, and offer sacred tamagushi branches at the main Inari shrine, the Fushimi Inari, on the Festival of Prayer for Sake Brewing every November. Traditionally, rites are always held without fail at the Inari shrine in each brewery on important dates such as the Ohitaki Festival in November or the Ninouma Festival in February. Even today, when science and technology are harnessed to brew high quality sake, prayers and offerings of thanks to the gods for safety and prosperity are a vital part of running a company. ▲The Ohitaki Festival (L) and the Ninouma Festival (R) at the Inari shrine in Gekkeikan's Uchigura Sake Brewery. Company management and brewery chiefs have assembled. The Ohitaki Festival is held in the Inari shrines in each brewery every November. November is the time of year when the sunlight is weakest, and so, to pray for its rejuvenation, rice straw is burned to predict good or evil for the future. The Ninouma Festival is held in February. 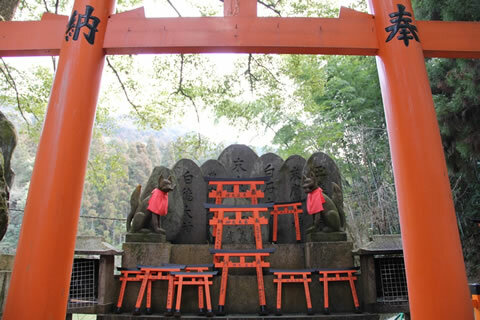 The god Inari (Inari Okami) was enshrined on Mt. Inari in February 711, and the first Day of the Horse (uma) in February is Hatsuuma (First Horse) and the second is Ninouma (Second Horse), when rites are held. As an object of worship, Mt. Inari is filled with numerous shrines along the mountain paths that wind through the sacred area. The 2 km-long route that leads to the top of the hill is called Oyama-Mairi, or Mountain Pilgrimage. The route heads up through the Thousand Torii from behind the Main Hall to the Rear Shrine (okusha,) then further up past the Kumataka Shrine and the Santoku Shrine to the Mitsu-tsuji three-way intersection, and then on to the Yotsu-tsuji four-way intersection, the entrance to the summit area. ▲The foxes guarding the Ganriki Shrine. As the Japanese name, Eye Power, suggests, this shrine is believed to be good for healing the eyes, and business managers also come here to pray for far-seeing eyes or foresight. Walking along the pilgrimage route and experiencing the natural environment also allows one to sense the divine world of prayer. Taking the relatively gentle path to the right from Yotsu-tsuji, in order from the bottom, climbers will first reach the Third Summit (san-no-mine) where the Lower Shrine (kasha) is, the Middle Summit (ai-no-mine) where the Kada Shrine is, the Second Summit (ni-no-mine) where the Middle Shrine (chusha) is, and then the First Summit (ichi-no-mine,) home to the Upper Shrine (kamisha). Taking the left path, climbers will pass the Osugi Shrine, the Ganriki Shrine, the Yakuriki Shrine, the Ishii Shrine, the Oseki Shrine, and the Choja Shrine, and then, after a steep climb, will arrive at the Upper Shrine. Taking either the left or right mountain paths from Yotsu-tsuji will lead you past all the shrines. ▲From the Yotsu-tsuji intersection at the entrance to the summit area you can see all of southern Kyoto spreading out before you. Dotted between the different shrines along the path to the summit of Mt. Inari are teahouses serving worshippers, providing a place to rest and relax. They also carry sets of offerings for parishioners to buy. ▲Otsuka Mounds are erected that almost seem to enclose the shrines along the path. These mounds are also types of rock shrines called iwasaka built by religious organizations or individual worshippers that house the deity respectively, and there are supposedly some 10,000 such dotted around Mt. Inari. The designs used in this corner include images photographed by Gekkeikan with the permission of the Fushimi Inari Shrine (Fukakusa Yabunouchi-cho, Fushimi-ku, Kyoto) and the Gokonomiya Shrine (Gokogumonzen-cho, Fushimi-ku, Kyoto). Copyright(c) Gekkeikan Sake Co.,Ltd. All rights Reserved.